As we continue to shift our focus on supporting the entire hypothalamic pituitary adrenal axis rather than laser focusing on just the adrenal glands we can see the important role that stress has on the overall picture of health. Herbs such as Ashwagandha, Rhodiola and Holy basil have been utilized in Ayurvedic and Chinese cultures for centuries; with Russian scientist, Nicholai Lazarev, coining the term adaptogen in the 1960’s. The 30-second elevator speech is often along the lines of “adaptogens help modulate the stress response in the body,” while true, this broad definition leaves practitioners (and patients alike) wanting to know more about the clinical application and how to appropriately dose. These botanical herbs can support homeostasis within the nervous system and can serve as the foundational strategy to any treatment protocol. A second study of interest confirms the use of Ashwagandha and cognitive health. 3* The results of a 2014, double-blind, placebo-controlled trial using Sensoril® Ashwagandha showed its strong benefits of improving cognition and psychomotor function. * The trial included healthy men who received either the placebo or Ashwagandha extract twice daily for a period of just 14 days. Rhodiola (Rhodiola rosea) acts on neuroglia cells, within the nervous system and inhibits monoamine oxidase enzymes.4 * Rhodiola, specifically WS® 1375, has been shown to support mild tension and stress. * A 4-week open-label study completed in 2012 evaluated the benefits of Rhodiola, specifically WS 1375 in participants with life stress symptoms.5 The participants were to receive 200 mg of WS 1375 twice daily for 4 weeks. There were multiple methods of assessment (7 in total) including perceived stress questioned, multidimensional fatigue inventory. Improvements were shown across all methods of assessment and reports of improved stress resilience and lowered fatigue was noted. * The key takeaway from this study was that improvement was seen in just three days after taking Rhodiola 200 mg twice daily. Holy Basil (Ocimum sanctum) is also referred to as tulsi or “liquid yoga” as it has strong anti-stress properties, leading to feelings of relaxation and calmness. * Several compounds isolated from the plant’s leaves, including ocimumosides A and B have been shown to influence metabolic stress, through supporting healthy glucose metabolism, plasma corticosterone, and plasma creatine kinase.7* This wonder herb has been the subject of a 60-day, 35 person clinical trial where the results showed improvement in attention, stress and nervousness.8* The primary method of assessment was the Hamilton Anxiety Rating Scale (HAM-A). Powders, teas, tinctures and capsules, oh my; the delivery method for adaptogens can vary greatly. For example, comparing the dosing between extract and tincture is similar to comparing apples to oranges; clarifying the form of the herb is important. When it comes to choosing an adaptogen I often pry when asking patients if they have previously tried adaptogens (or other botanical herbs). Some patients have in the past, often at a significantly lower dose, for example 20 mg of ashwagandha in their coffee elixr. Secondly, patients say they have previously tried the adaptogen, licorice root, which can be potentially stimulating for the sensitive individuals.9* When choosing a formula, I usually forgo the licorice and add it as a standalone if necessary. Practitioners and patients alike want to feel improvement, or they are less likely to follow through; this is especially true when it comes to stress and the management of stress. When suggesting a dose to a patient, it is typically recommended to start with the dose used in clinical trails. With clinical results being shown in just three days for Rhodiola taken at a dose of 200 mg, twice daily and within fourteen days for Ashwagandha at a dose of 250 mg twice daily, these herbs can provide reliable results for patients. In Ayurveda and Chinese culture, many herbalists prefer to prepare these herbs in blends or combination, rather than in isolation. This approach of blending herbs at their therapeutic dose allows the benefits to be effective and sustainable. When choosing a blend of adaptogens, finding a formula which includes each of the adaptogens is recommended for patient success. When a patient comments that they have taken adaptogens previously and felt no noticeable difference, I question further to ask which form and dose they were taking. The answer is typically 25 -50 mg, which is significantly lower than any dose used in recent studies. 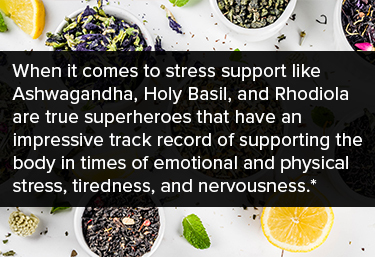 In summary, when it comes to stress support, adaptogens like Ashwagandha, Holy Basil and Rhodiola are true superheroes that have an impressive track record of supporting the body in times of emotional and physical stress, tiredness and nervousness. * While they have been around for hundreds of years, it is certain that they have a place in the 21-century. Yin H, Cho DH, Park SJ, Han SK. GABA-mimetic actions of Withania somnifera on substantia gelatinosa neurons of the trigeminal subnucleus caudalis in mice. Am J Chin Med. 2013;41(5):1043-51. Chandrasekhar K, Kapoor J, Anishetty S. A Prospective, Randomized Double-Blind, Placebo-Controlled Study of Safety and Efficacy of a High-Concentration Full-Spectrum Extract of Ashwagandha Root in Reducing Stress and Anxiety in Adults. Indian Journal of Psychological Medicine. 2012;34(3):255-262. Pingali U, Pilli R, Fatima N. Effect of standardized aqueous extract of Withania somnifera on tests of cognitive and psychomotor performance in healthy human participants. Pharmacognosy Res. 2014;6(1):12–18. Edwards D, Heufelder A, Zimmermann A. Therapeutic effects and safety of Rhodiola rosea extract WS1375 in subjects with life-stress symptoms--results of an open-label study. Phytother Res. 2012 Aug;26(8):1220-5. Kasper S, Dienel A. Multicenter, open-label, exploratory clinical trial with Rhodiola rosea extract in patients suffering from burnout symptoms. Neuropsychiatric Disease and Treatment. 2017;13:889-898. Gupta P, Yadav DK, Siripurapu KB, Palit G, Maurya R. Constituents of Ocimum sanctum with antistress activity. J Nat Prod. 2007 Sep;70(9):1410-6. Bhattacharyya D, Sur TK, Jana U, Debnath PK. Nepal Med Coll J. 2008 Sep;10(3):176-9. Walker BR, Edwards CR. Licorice-induced hypertension and syndromes of apparent mineralocorticoid excess. Endocrine Metab Clin North Am. 1994 Jun;23(2):359-77.